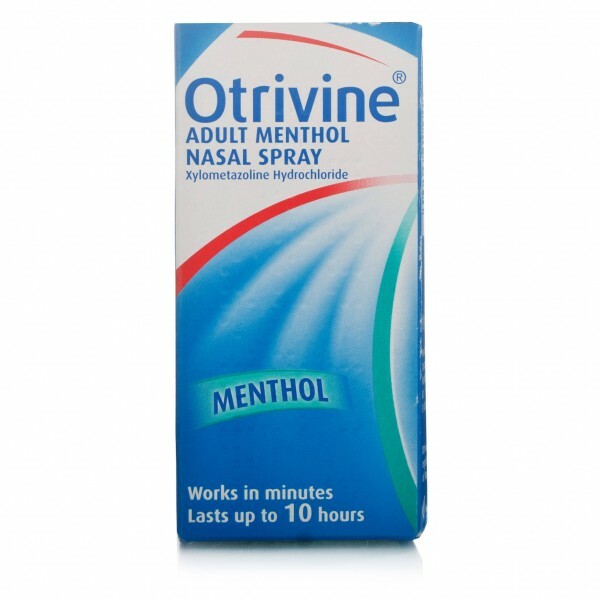 Otrivine Nasal Spray Menthol is specially formulated with methanol provides quick relief from nasal congestion caused due to colds, sinus and allergies. Otrivine Nasal Spray Menthol contains Xylometazoline, which belongs to a group of medicines called the sympathomimetics. It works by stimulating alpha adrenergic receptors in certain areas of the body. Xylometazoline acts on the alpha receptors in the walls of blood vessels causing them to narrow. This results in less blood travelling through the vessels which, in turn, decreases the amount of fluid pushed out into the nasal lining. This reduces mucus secretion and relieves the symptoms of nasal congestion in conditions such as allergies and colds. Xylometazoline is given as nasal drops or spray. This allows the medicine to act directly where it is needed and so reducing the likelihood of side-effects in other parts of the body. Directions for the use of Otrivine Nasal Spray: Adults and children over 12 years, 1 spray in each nostril 2 to 3 times daily. Otrivine Nasal Spray Menthol contains the following ingredients: Benzalkonium chloride, disodium phosphate, dodecahydrate, disodium edetate, sodium dihydrogen phosphate dehydrate sodium chloride, menthol, eucalyptol, sorbitol, marcogol glycerol hydroxysteatrate, purified water.